If you are touring Italy with kids who have had their fill of majestic churches and Roman ruins, a day at Gardaland may be in order. This landmark amusement park sits on the eastern flanks of Lake Garda and is the country’s most popular family-oriented resort, with more than 30 rides, musical performances and light shows, and an aquarium. Offering everything from dizzying drops on Space Vertigo to the very gentlest of carousels for toddlers, Gardaland theme park will keep the whole family happily entertained all day. Between the Jungle Rapids water ride, the San Andreas 4-D adventure, the spectacular musical and light shows in the Gardaland Theatre, and the thrilling roller coasters—the most popular are the Black Hole, Italy’s first “dive” roller coaster, and the Blue Tornado, a hair-flipping inverted coaster—there’s something here for children of all ages. Gardaland is hugely popular in Italy and very crowded from mid-June to mid-September, when schools are closed for the summer. Booking skip-the-line entry tickets is a good idea any time of year, but imperative during the summer months to avoid long waits at the ticket office. A monorail scoots around the perimeter of the park to take footsore kids (and parents) to their next adventure. The range of eating opportunities inside the park, from fast-food stands to themed restaurants, serves families well. Gardaland offers a number of dedicated services for wheelchair users and visitors with other special needs. The resort includes two Gardaland hotels with themed rooms, kid-friendly activities, and the Blue Lagoon pool. 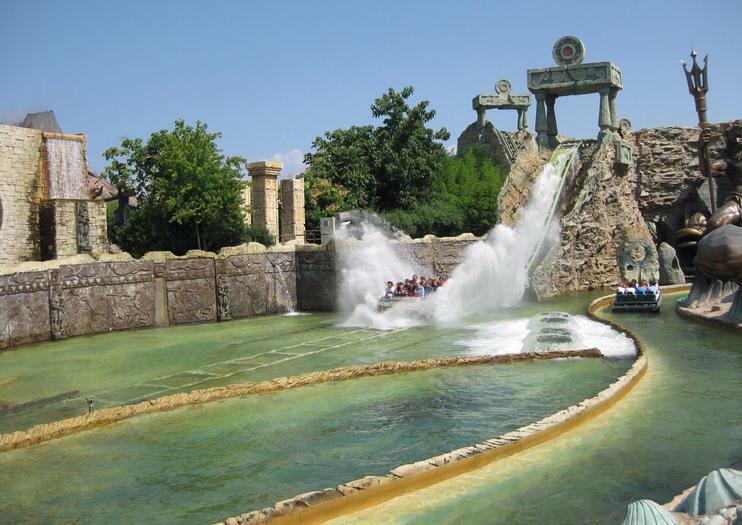 Gardaland is located in Castelnuovo del Garda, on the eastern flank of Lake Garda in northeast Italy. To reach Gardaland from Milan or Verona, take the train to Peschiera del Garda; there is a free shuttle bus from the station to Gardaland Park. If driving, take the A4 motorway to the Peschiera del Garda exit. Gardaland Park is open from April through October, and is most crowded from June through August. From mid-June to mid-September, the park closes at 11pm, giving you even more time to enjoy the rides. There are also select December dates when certain areas of the park reopen for winter festivities. Combine a ticket to Gardaland with entry to Sea Life Aquarium, where you’ll see sharks, manta rays, and turtles; observe shark-feeding sessions; and discover the underwater mysteries of Lake Garda. Save money and enjoy a day of unforgettable family fun by purchasing your ticket to Gardaland Park — northern Italy’s foremost all-age attraction — in advance. As well as enjoying an online discount, you’ll have access to all of the roller coasters, thrill rides, shows, and playgrounds in Gardaland Park. Plus, you’ll be able to explore the amusement park at your park and arrive anytime between 10am and 6pm, or until 11pm in August. Save your euros and time at the ticket desk when you book ahead to visit Gardaland Park and Gardaland Sea Life Aquarium. The combo ticket gives you instant entry to both attractions and can be used on just one day or over two consecutive days. Once inside the attractions you can take as much time as you like to enjoy family-friendly rides, rollercoasters, and a world of sea creatures.